Enhances skin beauty from within. Contributes to the maintenance of normal skin tonicity and elasticity. Contributes to skin hydration and smoothness. 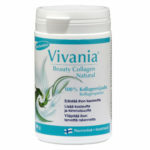 Vitamin C contributes to normal collagen formation. Natural ceramides from wheat for beautiful skin. Vitamin C for normal collagen formation of skin. For dry, sensitive and ageing skin. Versatile and effective body lotion to hydrate the skin, improve skin elasticity and firmness as well as to prevent the signs of skin ageing. Hyaluronic acid, Ubiquinone (Coenzyme Q10), Vitamin E and Jojoba Oil protect,nourish and hydrate the skin, improve elasticity and firmness, and strengthen skin structure. Versatile and effective 24 h cream to prevent the signs of skin ageing. Contains hyaluronic acid, ubiquinone (co-enzyme Q10), vitamin E, jojobaoil and other protective ingredients to support collagen and elastin production in connective tissue. Hyaluronic acid helps to keep skin youthful, supple, smooth, hydrated and toned. Ubiquinone activates the skin’s energy metabolism from within and continuously fights against wrinkles in the deeper layers of the skin. 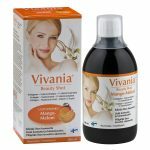 The antioxidants in Vivania® cream protect the skin against the harmful effects of free radicals and UV-rays. The cream’s pH is equal to the skin’s natural pH.